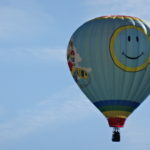 At the Albuquerque Balloon Festiva, I had many opportunities to witness the hot air balloons opening up. I filmed this one for you. It is amazing. How do they get the air in there? When do they add the fire? I hope you like it! They are posted in certain order so you get a sense of how they did it. The third video is of the balloons at night. The night balloons was the highlight of my trip! All opinions are mine. I was sponsored by the event.